Historical inaccuracies make Gladiators of World War II: The Kamikazes of limited value in learning about Japan's suicide attacks. 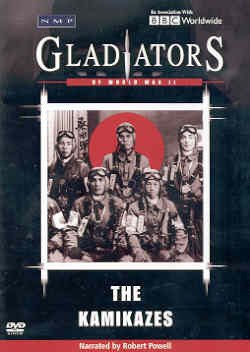 Three American and six Japanese veterans of World War II provide colorful commentary, but the narrator fails to even introduce their names or their connection to the attacks. Other detractions in this documentary include repeated or misidentified film clips, staged footage of kamikaze pilots, and mispronunciation of the name of the vice admiral who formed the first kamikaze corps . The documentary contains numerous incorrect statements. For example, the narrator states that kamikazes struck the carrier Franklin in March 1945 , but the ship actually was hit by two bombs. The documentary erroneously indicates that the Japanese used Iwo Jima to mount kamikaze air attacks . The date of Japan's first mass kamikaze raid on Allied ships off Okinawa is given as April 4 rather than the correct date of April 6 . Near the end of the DVD, the screen shows the Kaseda Peace Museum (now known as Bansei Tokko Peace Museum) as the narrator mentions that in Japan today there is a kamikaze museum . However, the narrator makes no mention of the Chiran Peace Museum for Kamikaze Pilots, the largest kamikaze-related museum, and several other museums with exhibits related to kamikaze pilots. Background information is provided on the reasons for Japan's decision to use suicide attacks, but some of this material has little direct connection. More than a third of the film deals with events not directly related to suicide attacks. After completion of the presentation of kamikaze attacks at Okinawa, which occurs about ten minutes before the film's end, the remainder of the documentary proceeds very slowly. This DVD, full of factual errors, has no special features to set it apart from other documentaries on kamikazes. 1. The narrator's pronunciation of "Takijino Onishi" (at 13:10 of DVD) should be "Takijiro Onishi." The back cover of the DVD package also gives the incorrect spelling of "Takijino." 2. At 28:40 of DVD. 3. At 22:00 of DVD. 4. At 30:25 of DVD, the narrator states that the Japanese launched the first mass kamikaze raid three days after the landings at Okinawa, which occurred on April 1. Therefore, according to the DVD, the date of the first mass kamikaze attack would be April 4. 5. At 46:00 of DVD.